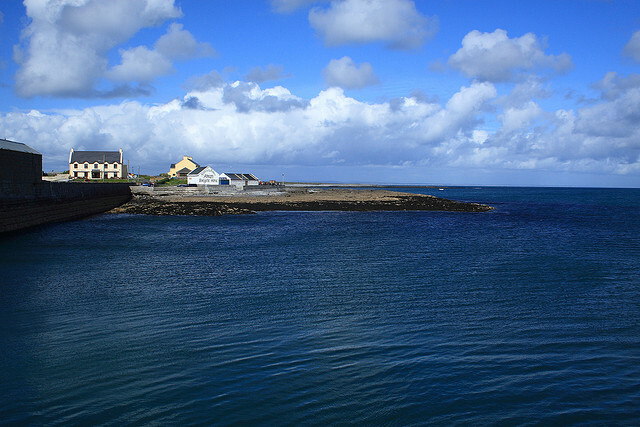 The Aran Islands are a group of three islands which take place at the mouth of Galway Bay. It involves three islands: Inishmore, the largest, known as Aranmore, Inishmaan, the second-largest and Inisheer, the smallest. It is approximately 14 km long and 3.8 km wide. 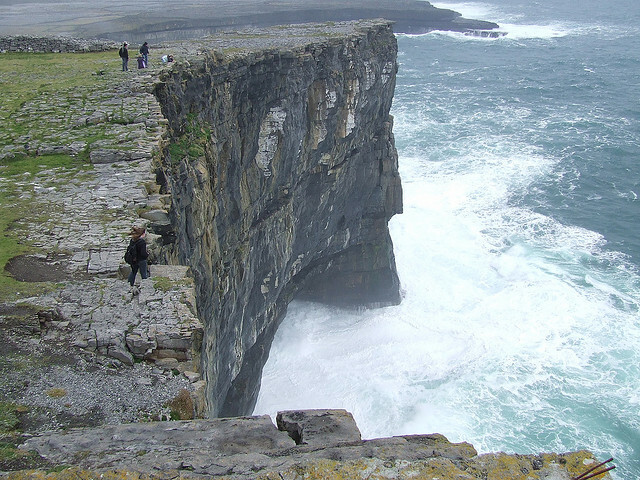 Inishmore is a tourist paradise where you can feel the calmness and listen to the silence. Aran has a plenty of wildlife and you can find almost 437 varieties of wild flowers. 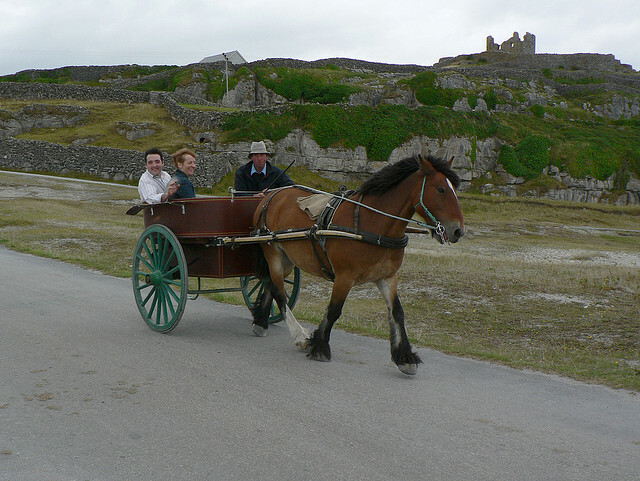 In this beautiful island everything is possible: biking, pony ride, walking or exploring the islands by a modern minibus. 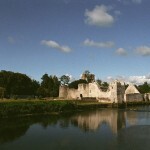 There are two options to visit Aran: by air from Indreabhan or by ferry boat from Galway City. You can see this beautiful island on horseback along the roads of history. It is also possible to swim in unpolluted seas, paint or write, study infrequent flowers, take pictures or just relax. After dark you can enjoy Irish music and dance in an Island pub. In Aran Islands Irish is the primary language, but all islanders are fluent in English. The islanders are very friendly, so do not be afraid of them. There you can find mini-bus tours. These have tolerable price and usually come with a local guide. Their livelihood is assured by tourism. I recommend two drivers: Martin Mullen and Oliver Faherty. Both of them live there for generations. Another way to explore the islands is on foot or by bike. If you cycle you should wear a helmet and good shoes, because the roads are very tortuous and bumpy. Dun Aengus is the most famous visited place at Aran Island and it is a fort situated on the edge of a cliff. It consists of concentric circular walls. The citadel encompasses an area which is 50 meters in diameter and with 4 meter walls of stone. Dun Eochla and Dun Eoghanachta are ringforts which are located in the inside part of the island. This beautiful attraction is at the same road. O’Brien’s Castle in the Aran Islands was built in the 14th century and it was taken from the famous O’Briens by the O’Flaherty clan in 1582. Clochan na Carraige is a very interesting and unusual beehive hut, because the inside is rectangular, but the outside is circular. It is possible to change money on all three islands, but just Inis Mór has an ATM which is in the inside part of the island’s only supermarket. 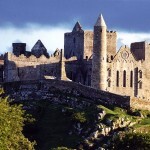 Inis Mór is the the most touristy of the islands and there it’s easy to find accommodations. 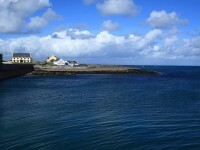 Inis Oírr also offers staying options, but is much quieter.